Rust is the red/orange coating that forms on the surface of metals when they are exposed to moisture and air, also known as oxidation. If any part of your vehicle is overly exposed to rain or salt, the area on your car will begin to rust. A small chip in the paint or a dent in your car can also cause rust. If the area is left untreated, The rust will spread throughout the body of your car and eventually destroy it. Repairing the damaged area as soon as possible will prevent any future rusting. With a little patience and a strong, steady hand, you can remove rust from a car in just a couple of hours. Step 1: Remove the rust with sandpaper or a grinder. Depending on the extent of the rust on your car, you can sand a small area with 600 grit sandpaper. Sand the area using small, circular motions. If the rusted area is too large to sand by hand, you can use an angle grinder. Grind the are while using a wire brush cup. Hold the grinder in your hand and allow it to spin on the surface. Grind the entire rusted area until you see bare metal. If the rust damage has created holes in your car, you may need to replace the damaged area with sheet metal or a new panel. Step 2: Apply a rust convertor to the rust. The chemicals in the rust convertor change the chemical composition of the rust. This will turn the rust black and stop any future oxidation. Step 3: Wet sand the area. Soak a piece of 800 grit sandpaper in a glass of water for about two minutes. Sand the area until the area is smooth. Wet sanding eliminates the excess dust normally accumulated during the sanding process. Step 4: Wet sand that area again with a piece of 1,200 grit sandpaper. This will prepare the area for priming and painting. Step 5: Spray the entire area with a self-etching primer. This primer will protect the metal, from future rusting, by sealing it and forming a moisture barrier. Allow the self-etching paint to dry. Step 6: Apply a layer of regular paint primer. Allow the primer to completely dry before attempting to paint. Make sure that the paint you choose matches the existing paint color as much as possible. Each car contains a hidden sticker that includes the details of your car, including the paint color code. This sticker can be found under the hood, in the glove box, in a door jam, or in the driver’s door panel. Take the paint color code to an automotive paint shop to determine a matching paint for your vehicle. To prevent any further rust from damaging your car, immediately treat any dents, dings, or chips in the body. 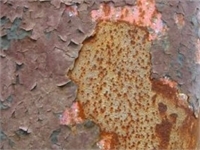 Rust forms rapidly and it can develop without warning. Treat every spot, big or small, before the rust spreads and causes severe damage to your body and frame.